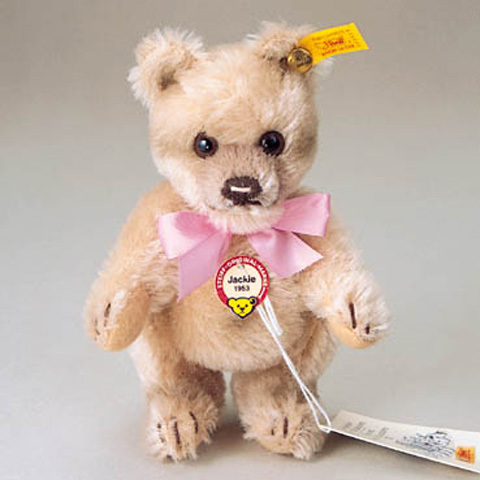 Steiff Mini "Jackie" 1953 Replica Teddy Bear, EAN No. 029929. Jackie is 6.5" Tall 16cm, has honey colored mohair woven fur and is fully jointed. From the Historic Steiff Miniatures series manufactured in Germany from 1994 to 2001. Yellow tag item - not produced with a box. New - Includes Steiff hang tag. • Ear tag: Yellow tag; brass-plated "Button in Ear"